By tram, alight at Hellichova and walk 150 metres in the direction of the Lesser Town Square (Malostranske namesti). The museum is located on the right-hand side. It is also an easy walk from the Lesser Town Square. The Czech Museum of Music (České muzeum hudby) in Prague is located in the former Baroque church of St. Mary Magdalene, built in the 17th century in the Lesser Town. The building underwent major reconstruction some years ago, and now blends early Baroque church architecture with contemporary design. The stonework in its grandiose assembly hall gleams, and the lighting, both natural and from spotlights, shows off the true height and intricate aspects of the building. The Czech Museum of Music has a collection of around 700,000 items, documenting the history of music in Prague, and in the wider world. The most extensive area covered is the Music Notation Archive and the Recordings Library. There are also collections of manuscripts, iconography and press documentation, as well as materials from personal estates, libraries, the Musical Instruments Collection, and some fascinating items from the two great Czech composers, Bedřich Smetana and Antonín Dvořák. 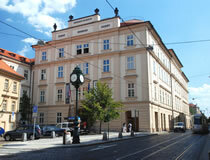 In addition, the Czech Museum of Music occasionally hosts temporary exhibitions. These appear in our Prague events calendar.